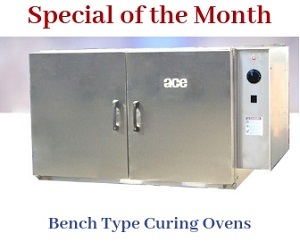 ACE provides a wide range of coil winding machines and equipment. We can meet every coil winding need, complete machines to coil heads, loop bars, tail stock, wire racks, and de-reeling and tension stands. We offer more than 15 different types of coil winding machines. The coil winders are offered in the following types – light duty, medium duty, heavy duty, bench type, bench type hand winder, and programmable winding machinery. We also manufacture tension devices, wire racks, winding heads, de-reelers, automatic tensioners and traversing units. Our inventory consists of a wide variety of winding and tension machines. Many machines in the ACE inventory are designed with face plates. These make the machine quite versatile. A variety of fixtures and heads can be installed, allowing the user to wind different types of coils. Certain ACE coil winders are designed as high torque winding machines, utilizing an AC flux vector drive. These machines are particularly useful for winding shaped wire and foil as in transformers. Twisting the locking handle on the mandrel block. A single cam lever motion allows the winding loop to be removed. A pneumatic valve can be energized to slide the coil off from the machine. A collapse mechanism employed in a single lever action helps remove the coil. Depending on the model, a tailstock can be installed to provide additional support. All winding equipment is constructed with close tolerance machined parts. These help provide a long service life. Medium duty coil winders are designed with heavy duty enclosures to protect the winder’s mechanical components and to prevent damage when winding large coils. The enclosures are designed to provide easy access for maintenance. General coil types include rotor, transformer, hairpin, and diamond shaped coils. The machines consist of bearing pillow blocks. The drive shafts are mounted onto the bearing blocks. The bearings are precision built, and are designed to be anti-friction, and self-aligning. Certain medium and heavy duty coil winders are designed with speed control and adjustment features. The speed of the coil winders can be adjusted with one or two components, depending on the model chosen. The first option is the foot pedal, which can be used to depress and adjust the machine speed. The second option is a potentiometer, which is mounted on the machine’s front panel. The programmable winding machines consist of electronic panels with displays. This allows the user to program all winding parameters to his needs. Parameters include wire pitches, brakes, layer stop, taps, and display menu items. The display screen also allows the user to search for the method using data such as name, drawing, and part number. Some models are also designed with touchscreen displays. This leads to immense savings in terms of both time and parameter input. The touchscreen also allows for winding methods and other data to be printed. This allows the user to create detailed reports of the winding process. Programmable winding machines rely on Switch Mode Power Supply (SMPS). This allows the machines to provide continuous operation in a range of voltages. Some models are available with memory and graphic displays. This allows the operator to input and store a variety of coil windings methods. By simply choosing a required method, the coil winding process can be completed within a shorter period of time. Depending on the model chosen, a user can save up to 200 winding methods. Programmable winders consist of a 16 bit microprocessor. This gives the winder the capability to store up to 95 programs with 9 sub sections for each program.